The Pantheon is the most well preserved ancient building in Rome. It is a sacred building which as the name suggests was formerly dedicated to all of the gods. 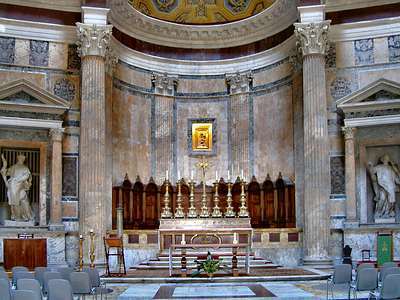 Today the Pantheon is a catholic church in which Mass is regularly said every Saturday at 17 hours and every Sunday at 10.30. The Pantheon was built in the years 118-125 AD by the emperor Hadrian on the Campus Martius near the Roman Forum. As it was converted into a Christian church (Santa Maria ad Martyres – St Mary and the Martyrs) soon after the demise of ancient Rome, it was not used as a quarry and thus has been exceptionally well preserved. Many visitors are to this day enthralled by the extraordinary architectural design of the building – this starts with building materials. 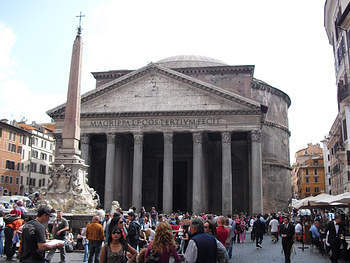 To date the Pantheon is considered to be the first building in the world to have been made of concrete. The self-supporting dome has a diameter of approximately 43m and is almost equally as high. For many years it was the largest dome of its kind in the world. The Pantheon is the most well preserved ancient building in Rome. One enters the main building through a portico with 16 Corinthian columns. The main building is a bright circular structure. The only internal light source is the so called ‘Oculum’ (eye) – an opening with a diameter of 9m located exactly at the apex of the dome that allows natural daylight into the building. This architectural solution is ingenious as aside from the lighting effect it creates and in addition to the cassette structure (which again is not only for decoration) it helps to reduce the weight of the dome. For some time after it was built the interior of the dome was decorated with gold glaze – this must have been a truly overwhelming sight. The dome symbolises the sky and the Oculum, symbolises the sun. The Pantheon was the model for numerous other domed structures that were later to be built. The most famous among these being St. Peter’s Basilica in Rome and the Capitol in Washington. The Pantheon additionally houses numerous important paintings and the graves of important figures from the Italian Renaissance such as e.g. the painter Raphael. Entrance to the Pantheon is free, as is the case for all churches in Rome. It is easily accessible using transport – using the bus one takes bus route 119 to the stop ‘Pantheon’. Opening times are daily from 8.30 – 19.30 and 9am-18.00 on Sundays.